Unarguably powerful audio editing, but the layers concept feels musically flawed and the workflow is laborious. Highly professional wave editing. Vast metadata capability. Useful wave analysis tools for mastering. Clunky, slow workflow. Layers hard to select and cannot solo. Hard to navigate. Unfamiliar setting for users of other audio editors. Audiofile Engineering describes Triumph as an Audio Designer for Mac, which is a fancy way of saying it's an audio editor. It's one with aspirations towards mastering too, and it can also be used to layer up sounds in a quasi-multitrack style, as well as apply effects. It isn't a sound creator or generator, though, and it has its own particular approach to the fundamentals of audio editor functionality. "Audiofile has called on iZotope to supply some of the built-in processors, including useful dithering and restoration tools"
Triumph takes its lead from image editors like Photoshop, using the convention of layers rather than tracks. Essentially, you have one stereo track on which an infinite number of layers can be placed, either stacked on top of each other to combine audio layers, or laid out sequentially like a playlist for mastering. It's designed for manipulating digital audio and arranging it for export. It hosts Audio Units plugins, and Audiofile has called on iZotope to supply some of the built-in processors, including useful dithering and restoration tools. 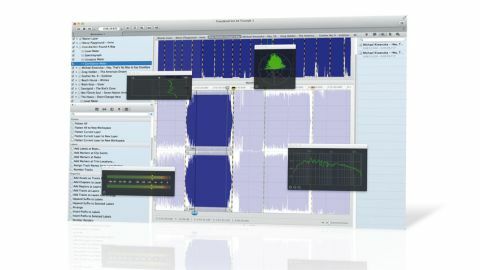 Triumph supersedes Audiofile's Wave Editor software. Just like its predecessor, it's a Mac app to the core, with that characteristic native OS X appearance, full-screen support and heavy use of AppleScript throughout. You can even write your own AppleScripts to automate repetitive tasks, and import other people's. The interface is contained in a single window that comprises a total of eight sections, three of them collapsible. The main two are the Layer pane and the Waveform pane. The former lists all active audio assets, so in a mastering situation, for example, it would be a list of songs with each on its own layer. The Waveform pane shows your audio files' waveforms, with the active layer highlighted. To activate a layer you have to select it at the top of the workspace above the Overview Pane - curiously you can't do it in the Layer Pane, which leads to all sorts of operational confusion. Oh, and you can't solo layers, which is like not being able to solo tracks in a DAW. The bottom-left pane is multifunctional, showing audio assets, plugins, edit shapes, labelling options and Actions. The Actions list is the engine room of Triumph, in which you can perform a huge variety of operations (see Triumph Actions). The right-hand pane is also multipurpose: track labels, metadata, wave analysis, renders (includes DDP export) and burns. "Everything you could possibly want in terms of wave building, conversion and more is here"
Everything you could possibly want in terms of wave building, conversion and more is here. The list of metadata fields is endless. Finally, below the Waveform window, the SmartEdit list shows all your fades, cuts, splices, etc. Triumph is an impressively comprehensive audio editing application that lets you do pretty much anything you could ever need to do to your audio files. There is a slight sense of identity crisis, though - it's a hugely powerful editor that wants to be a mastering tool and some sort of DAW, too. The drawback is the workflow, which is clunky, slow and arduous. It could be that the fundamental Layers approach - which could be described as reinventing the wheel - is flawed. It doesn't feel at all musical, and perhaps that's the root problem: it feels like it's been (very well) designed by programmers for programmers, rather than musicians.